What is Food For Friends? 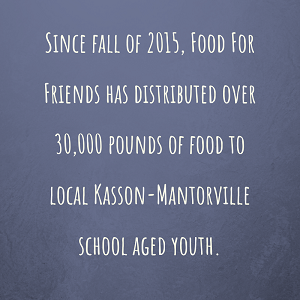 Food For Friends is a community-wide ministry that discreetly provides nutritious, child-friendly and easy to prepare foods to Kasson-Mantorville students in preschool through grade 12. There is no cost to the student or family to participate during the school year and over summer break. Food insecurity can have serious consequences for children. Not only does it negatively affect their physical and mental development but it can also limit their academic success. Access to nutritious food through discreet backpacks and in-school food shelves gives students the opportunity to grow and pursue their dreams. Each week throughout the school year, participating Headstart, Preschool, and Elementary students receive a backpack filled with food to sustain the students through weekends and breaks when they do not have access to school breakfast or lunch. Each backpack also contains vouchers to purchase fresh bread, milk and eggs. Middle School and High School students have access to an in-school food shelf where they are able to obtain nutritious and easy to prepare foods. These students may also obtain vouchers for fresh bread, milk and eggs. Food For Friends offers a summer food program ensuring that K-M families in need have access to sufficient food during the summer months. Examples of this supplemental food includes: milk, eggs, bread, peanut butter, jelly, cereal and snacks. Food For Friends partners with local school aged childcare programs to pack weekly bags for K-M families. Bags of food are distributed on a self-serve basis. We are inspired by the generosity of the the community to support Food For Friends through financial contributions and in-kind food donations. 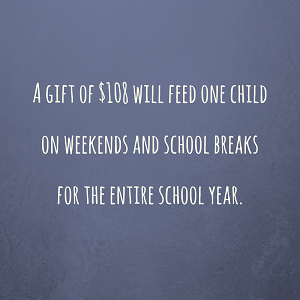 All food and cash donations that Food For Friends receives stay in our community to feed students in need. All food and cash donations that Food For Friends receives stay in our local community to help feed students in need. Every pound of food and dollar is important to alleviate hunger insecurity with our youngest learners. Thank you! Together, we can make a huge impact in the fight against hunger!